Forum Sydney is a news and current affairs television series that shines the media spotlight on issues affecting Sydneysiders, with special guest panelists, hosted by Brian Carlton. The debut episode features a lively discussion about Urban Planning hosted by radio personality Brian Carlton and special guest panelists Liam McKay (NSW Planning & Infrastructure Head of Communications) Dr Elizabeth Farrell (Sydney Morning Herald columnist), Chris Johnson AM (CEO Urban Taskforce Australia) and Sue Weatherley (Parramatta City Council). You’re Invited to join the Metro Screen family for an end of year social picnic at Reservoir Gardens across the road from Paddington Town Hall on Oxford Street, Wednesday 12 December from 5pm – 8pm. It’s a super casual B.Y.O. affair and we’d love to see you there. This year the Australian Screen Editors have added three new categories to their awards, incorporating a division in the largest entry pool, Documentary, and a new award for Open Content, which recognises online content and work that sits outside the traditional award categories. It’s interview time for the 2013 Certificate IV in Screen & Media Studies with over 80% of graduates finding full time employment in the industry. It’s the kickstart to get your film and television career off to a flying start. This full-time, industry focused, hands-on practical course has limited places that are filling fast. This advanced three-day workshop is a great chance for kids aged 11-15 years to create short films for TropJr and potentially kickstart a creative career in filmmaking. Participants are encouraged to bring with them ideas for short films or a script that may be selected for production over the course of the workshop. Each student will have the chance to write, act, shoot, light, direct, edit add a sound track and produce a TropJr short film project. 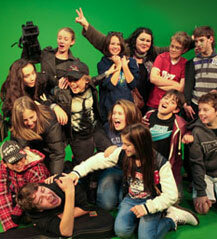 In three days the 21 students will learn the fundamentals of filmmaking all the way from script to screen. They will each have the opportunity to write, act, shoot, light, direct, edit, add soundtrack and produce, one of the following: short film, theatrical trailer, television commercial or behind-the-scenes documentary. Submit your job, event, film festival entry opportunity, giveaway or news item to the Forum anytime. The Japan Foundation, Sydney aims to promote cultural exchange between Japan and Australia as one of the 22 overseas offices of the Japan Foundation, which was established in 1972 in Tokyo. We organise a diverse range of cultural activities introducing art, culture and society, and coordinate various programs supporting Japanese studies and Japanese language education in Australia. To celebrate the screening of ABC’s new initiative Opening Shots where five emerging filmmakers under the age of 35 were given the opportunity to make a 30 minute documentary, the ABC is proud to announce the launch of their Mini-Shot competition. Mini-Shots is open to anyone who has a fresh, innovative take on an aspect of contemporary Australia that will get people talking. Deadline is 25 February 2013. A night of celebration will grace the Korean Cultural Office as a selection of award-winning short films screen as part of The Korean Short Film Night 2012, which aims to celebrate cultural diversity. Tales of Korean heritage features films from Australia, New Zealand, South Korea and the United States that focus on Korean stories in a newfound land. Featuring a trio of award-winning dramas that revolve around the theme of mothers and fathers. On 20 November the 2012 Screen Music Awards celebrated the gifted music composers who create magic behind screens both small and large. Held at Melbourne’s BMW EDGE, the Screen Music Awards [staged jointly by APRA and the AGSC] has recognised composers across 13 categories. This year’s recipients include two previous Golden Globe winners and while it’s an eclectic group they all share one common trait, the unique ability to adapt to any musical situation and tell a story without even a word being spoken. In 2009 Michel Bras, at the head of a 3-star restaurant in the heart of the Aubrac region in France, decides to hand over to his son Sébastien. A father and his son, both at a crucial time in their careers. Is it possible to pass on one’s life’s work? Is it so easy for a son to make a name for himself? This film is the story of a family over three generations, a fine reflection on heritage and passing down know-how. In 1967 Texan music teacher Conrad O. Johnson formed a band with his students at Kashmere High School that combined the passion of soul and the energy of funk with the dexterous arrangements of big band jazz. So began the 45-year legacy of the legendary Kashmere Stage Band. Sydney Festival’s Paradiso at Town Hall plays host to a special night combining the heart-warming, foot-stomping tribute of award-winning Kashmere Stage Band documentary Thunder Soul with a rare live performance by members of the reunited band. 2001: A Space Odyssey is arguably the most perfect marriage of visuals and sound in cinema history. In this Australian premiere, Sydney Festival and Sydney Opera House present Stanley Kubrick’s ground-breaking masterpiece with the dramatic power of a live soundtrack from the Sydney Symphony and Sydney Philharmonia Choirs. 2001: A Space Odyssey plays at the Sydney Opera House Concert Hall on 24th and 25th January 2013.